Smart Choice MRI operates 17 free-standing imaging centers, including six in Wisconsin. In what may be the first strike in a battle over what healthcare services should be provided in a hospital, Blues giant Anthem will no longer pay for MRIs and CT scans performed on an outpatient basis in hospitals across the country. As healthcare costs continue to rise, Indianapolis-based Anthem, which is run by a former health system CEO, is taking aim at a service that can be far more expensive in a hospital than in a free-standing imaging center. The service boosts hospitals' income, with some health systems collecting more than half of their profit from imaging services, according to Rich Bajner, a managing director at consultancy Navigant. So it's not surprising that hospital executives in the states affected by Anthem's policy are worried about their bottom lines being squeezed at a time when they are already dealing with lower patient volume and razor-thin margins. Looking to lower healthcare spending, Anthem will no longer pay for MRIs and CT scans delivered on an outpatient basis at hospitals. Executives at hospitals worry how that will affect patient care and their own bottom lines. Insurers have taken steps in recent years to cut costs and lower premiums, but some healthcare industry experts say this policy raises the stakes by refusing to pay hospital physicians for the imaging services they deliver to patients. It also puts physicians in the awkward position of turning patients away. Other industry experts point out that Anthem's efforts to reduce wasteful healthcare spending are in line with where the industry has been ehading and expect other insurers could follow suit once they see how the market reacts to Anthem's new policy. Anthem's refusal to cover an important hospital service marks the "beginning of the next wave of tension" between payers and hospitals, said Paul Keckley, a healthcare industry consultant. For its fully insured members, Anthem will no longer pay for MRIs or CT scans delivered at hospitals in nine states this year, unless a review finds it was medically necessary to perform the scans at a hospital. The policy will be rolled out to all but one of the 14 states where Anthem does business by March 2018, ultimately affecting 4.5 million members, according to an Anthem spokeswoman. New Hampshire is the exception. In the other states, patients will have to go to a free-standing imaging center instead of a hospital for some services. Anthem said the policy doesn't affect patients enrolled in government programs, such as Medicare and Medicaid, or those with self-funded employer coverage. Anthem said the policy will help keep premiums low and gives patients an opportunity to save hundreds of dollars, especially those members enrolled in high-deductible health plans. The policy went into effect in Indiana, Kentucky, Missouri and Wisconsin on July 1, and it will start in Colorado, Georgia, Nevada, New York and Ohio on Sept. 1. The imaging site-of-care policy comes on the heels of Anthem's announcement earlier this year that it will no longer pay for emergency room visits in non-emergency situations. That policy, meant to push patients to get care from primary-care doctors or in retail clinics, is effective in at least three states. Health plans have long been controlling costs through provider networks in which patients incur higher costs if they go to a doctor or hospital outside of the network. But healthcare industry experts say Anthem's policy is unique in the market. "It's such a blunt instrument," said Scott Wallace, an associate professor at the University of Texas' Dell Medical School and managing director of the school's Value Institute for Health and Care. "All it does is add dramatically to the bureaucracy of medicine instead of daring to find a more subtle and more flexible mechanism" to reduce costs, he said. He added that the policy would lead to fragmented care, and the burden would ultimately land on patients. Hospital groups agree. "Choosing a service line to rifle shot savings may benefit Anthem, but it doesn't improve care coordination or delivery," said Herb Kuhn, CEO of the Missouri Hospital Association. Other provider organizations say it prevents physicians from deciding what setting is most appropriate for the patient. Dr. Ezequiel Silva, chairman of the American College of Radiology's Economics Commission, said that disrupts the physician-patient relationship. Brian Tabor, president of the Indiana Hospital Association, said the policy will force doctors to spend less time caring for patients and more time fighting for reimbursement. It could mean more physicians will likely end up going through a lengthy and convoluted appeals process, increasing administrative costs for hospitals, he said. "A physician's time is being taken away from patient care and refocused on claims adjudication, and that's not good for our healthcare system," Tabor said. Anthem's imaging program also threatens finances at hospitals when most are already dealing with lower admissions. Five to seven years ago, imaging was "a gold mine" for hospitals, Keckley said. But those services have come under intense scrutiny over the years. Insurers began partnering with radiology benefits management companies to reduce the amount of wasteful diagnostic imaging tests delivered at hospitals and thus, strip out costs. Anthem is partnering with AIM Specialty Health, one of those management firms, to implement its site-of-care program. It's unclear just how much the average hospital's income is tied to imaging services. While shrinking, several sources said it still accounts for a significant percentage of profit at most systems. Bajner said a few CPT codes for radiology services can make the difference between a large health system recording a profit or loss. That means imaging services cost insurers a lot of dough. And since MRI prices vary wildly across sites of care, that service line is ripe for medical management. For example, the price of an MRI of a limb delivered at a hospital averages $1,567, while one provided at a free-standing imaging center costs $504 on average, according to healthcare price transparency company Amino. Free-standing clinics cut costs because they are providing just one service and therefore have less overhead and much fewer staff, said Rick Anderson, CEO of Chicago-based MRI chain Smart Choice MRI. Hospitals, on the other hand, may have to raise imaging prices to make up for other service lines that are losing money, he said. Smart Choice has 17 locations total and six in Wisconsin, one of the states affected by Anthem's new policy. Anderson said the Wisconsin locations are already seeing an increase in patient visits, which he attributes to Anthem's program. "That is a big step in the right direction for the consumer, and I think the payers have finally said: Enough, we're fed up. And Anthem took the lead," Anderson said, adding that the policy is a "win" for independent imaging providers like him, but also for consumers who he said will spend less for the same quality service at a more convenient location. Many experts agree that there's no difference in the quality of imaging services at hospitals and free-standing centers. Calls to some hospitals affected by the new policy were not returned. 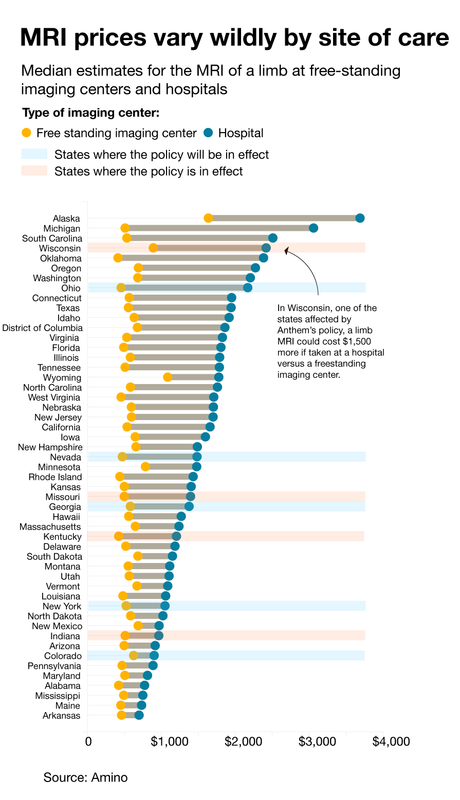 Hospitals should have seen Anthem's policy (or one like it) coming, some experts said. Anthem's policy aligns with what payers have been trying to do for years—push patients toward outpatient, lower-cost settings. Hospitals have been investing more into ambulatory care too. 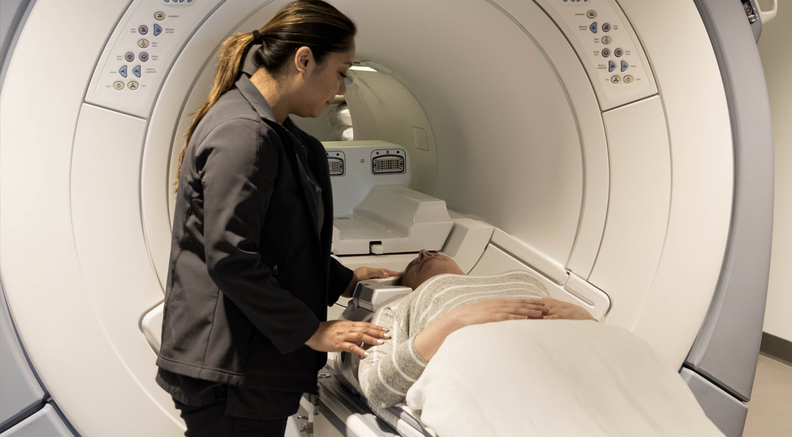 Some have opened their own free-standing imaging centers and could capture Anthem members who are forced to seek imaging services outside of the hospital, said Lea Halim, senior consultant of research with the Advisory Board Co. The policy is also in line with growing consumer demand for more healthcare options and convenience, driven by the growth in enrollment in high-deductible health plans. While patients could possibly endure delays in care, "in general this is going to be a benefit for patients, assuming they have a place to go," Halim said. More health insurers are expected to implement broad-based payment policies like Anthem's imaging program as they look for new ways to cut costs, hold down premiums, and make their margins. Navigant's Bajner anticipates that insurers could soon take aim at elective outpatient surgeries and lab services, where there's a big difference in price depending on where the patient goes. Keckley said orthopedic services would be a likely target. But such policies mark a step backward for the provider-payer relationship, they said. Providers and insurers, which have historically had an adversarial relationship, have become more collaborative through joint ventures and accountable care organizations. Anthem's imaging policy does nothing to further that partnership, Keckley said. "The impasse between insurers and hospitals is just going to continue to get tougher and tougher," he said, "and this is just one of several areas where (insurers') plans to pursue lower premiums and reduce their expenses are going to become much more aggressive." Correction: This story was updated Aug. 30 to correct the spelling of Lea Halim's last name.